The spotlight's on! 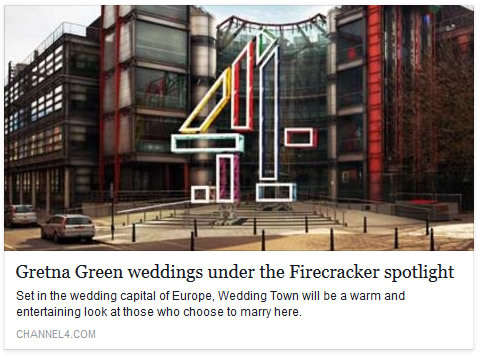 Gretna Green weddings are hitting the small screen! We have been home to hive of activity as a film crew from Firecracker Films have been based in Gretna Green this summer filming a special programme called Wedding Town which will be shining a spotlight on Gretna Green, one of the world's most famous wedding destinations, on Channel 4 this autumn! Firecracker have been busy collecting footage following different weddings, blessings and vow renewals taking place across Gretna Green and will be including the special ambience and tales from our very own Famous Blacksmiths Shop! Set in the wedding capital of Europe, Wedding Town, will be an entertaining look at those who choose to follow in the footsteps of centuries of tradition and marry here....as well as the many teams involved behind the scenes to make each ceremony special. From the wedding planners, professional witnesses, florists, cake makers and even pipers, Wedding Town will follow all of the drama and the romance of each ceremony and those that made it perfect. It's starting to feel real now that the first press releases have come out and the release date approaches! The team are keen to have chats with the brides and grooms who will be marrying in Gretna over the next month to find out more about each couples' wedding plans and to hear more about each individual romantic story in the lead up to their special day! Why flee to Gretna Green?